Guinea pigs, also known as cavies, are delightful, happy creatures, and they make good, interactive companions. Guinea pigs are relatively easy to care for, but your guinea pig will need a large cage. A large cage means plenty of soft bedding, which can get expensive. There are many types and brands of bedding on the market, but an increasingly popular choice among guinea pig owners is flannel bedding. Using flannel blankets instead of traditional shredded bedding can be more economical, and better for the environment. When used properly, flannel bedding can be a healthy choice for both you and your pet guinea pig, especially if a household member has allergies to traditional bedding material. There is less waste when using flannel bedding, since you will be washing the flannel each week rather than throwing it out. Using flannel will require an additional load of laundry or two, but traditional bedding can also get expensive, particularly when you are trying to fill a large enough cage. If you do use use traditional bedding, be sure to pick bedding made from aspen or hardwood shavings. Avoid cedar or pine shavings, as the oils can be harmful to your guinea pig. Guinea pigs need a clean and dry environment, and the softer the better for their delicate toes. If you want to use flannel as bedding, you can buy inexpensive lightweight fleece blankets, or make a trip to your fabric store. Triple wash the flannel before use -- this will activate the wicking properties of the material. Use a fragrance-free detergent. You may tumble dry the flannel using dryer sheets, but do not use liquid fabric softener. Liquid softener will impact the fabric’s ability to wick away moisture. Place an absorbent towel under the flannel. Some guinea pig owners use puppy pads, although this can get expensive; another option is to use disposable bed pads underneath the fleece. If your guinea pig is a burrower, you can clip the flannel into place with binder clips or clothespins. This will prevent her from soiling underneath the protective layer of flannel. Guinea pigs have sensitive respiratory systems. Your guinea pig's natural environment is very dry, and she will not do well in a moist, humid cage. Whether you use traditional shavings or fleece bedding, it is very important to change your guinea pig's cage at least once a week. 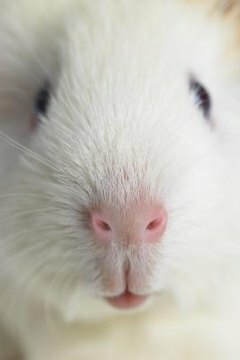 If you have more than one guinea pig housed in the same cage, you may need to clean mid-week as well. Keeping her housed on wet fleece or shavings will expose her to ammonia buildup, which can cause pneumonia and upper respiratory infections. If your guinea pig is lethargic, wheezing, and/or has discharge coming from her eyes, you will need to take her to your veterinarian immediately, as these are signs of a possible URI. Dirty bedding can also lead to bacterial growth in the cage, which can cause urinary tract infections. Make sure your flannel bedding lies flat against the bottom of the cage. Flannel that bunches up can cause your guinea pig to overheat in the hot summer months. Owners who use fleece keep a small handheld dust broom nearby. Sweep away feces on a daily basis, and check the fleece for any signs of moisture. At least once a week, strip away the fleece and clean out the bottom of the cage with a safe cage disinfectant. When used properly, flannel bedding can be a healthy choice for your guinea pig, and a nice one for your pocketbook too. She will love the soft feeling of the flannel on her feet, and you will love the bright colors and creative look of her cage. Using fleece bedding will cut down on the waste and cost of using traditional shavings. As long as you are careful to keep her cage clean, flannel bedding should not smell any more than a properly maintained cage using traditional shavings. A clean cage is a healthy cage, no matter what type of bedding you use.